An exclusive luxurious world awaits you aboard the Jeanneau Yacht 58. Welcome to an elegant world of offshore cruising. Ease of use and comfortable living is ensured by exceptional interior and deck plans by Garroni Design. 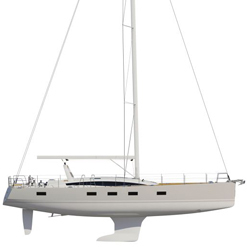 From the drawing boards of Philippe Briand comes the long waterline and careful weight distribution that ensures speed and seaworthiness unmatched in her class. Every detail has been conceived to offer the highest quality cruising experience. This elegant offshore cruiser offers an exceptional interior and deck plan designed by Vittorio Garroni with ease of handling in mind. Every detail has been conceived to offer the highest quality cruising experience in the Jeanneau Yacht 58. The new style of contemporary interior reflects a long nautical heritage. Rich materials are found throughout including leather, blond teak flooring and stainless steel. Sleek windows and skylights bathe the interior in light. Welcome to the world of Jeanneau Yachts!! 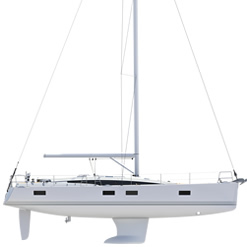 Jeanneau 360 Docking Manoeuvring a yacht of over 12 metres in harbour is stressful for many skippers and their crews, whether family or not. 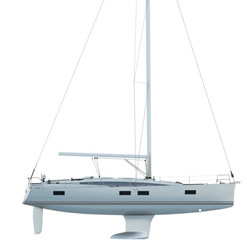 That’s why Jeanneau have taken away the stress and developed 360 Docking. Even with a bow thruster, the bulk, the inertia and the sensitivity to windage and tides of these boats makes their handling difficult in the often small and congested ports of the European coasts. These problems can spoil the enjoyment of a lovely sailing trip, as well as put you off the acquisition of a larger model, this no longer needs to be a factor and couldn’t be simpler to control.